Ben and Jerry’s makes tasty ice cream with flavours like “salted caramel & brownie”. What about a beer with this taste? 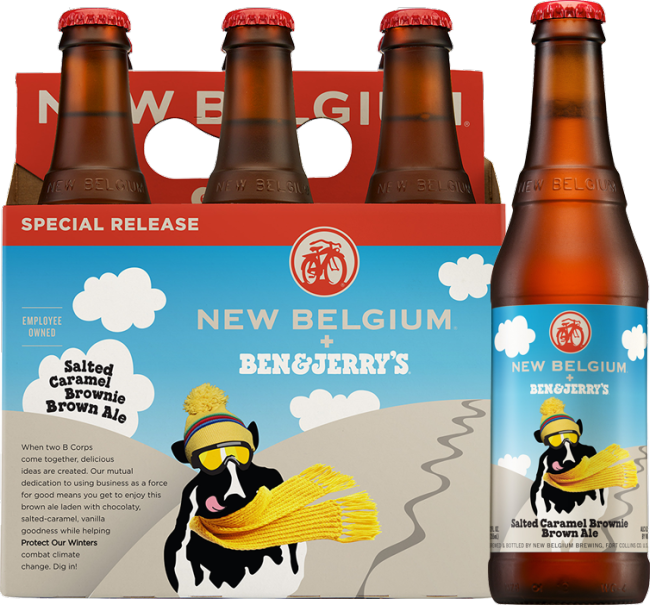 The famous American ice cream manufacturer decided this would be a good idea and started a colaboration with New Belgium Brewing to launch a beer which they call Salted Caramel Brownie Brown Ale. Don’t start running to the stores just yet - the beer will only be available in the fall. Us poor souls here in Belgium probably won’t have the luck to find this beer in our stores but it should be widely available in the US. The reason for the collaboration between Ben & Jerry’s and New Belgium Brewing is a similar philosophy. The two companies have more in common than you would think, including their policy on transparency and attention to ecological causes. The profits of this beer will be going to the Save our Winters organisation which creates awareness about climate change. Jay Curley of Ben & Jerry’s said “We’re great fans of New Belgium Brewing, their values, their playful corporate culture and of course their beer. Our fans can expect something very tasty”. Of course not everybody is happy about this development. Bruce Lee Livingston of the Alcohol Jusice organisation, an alcohol industry watchdog consumer group, claims: “It’s a crass, corporate greedy move to put put a brand name like Ben & Jerry’s on a beer, It’s bad for children — who will start looking at beer as the next step after ice cream.